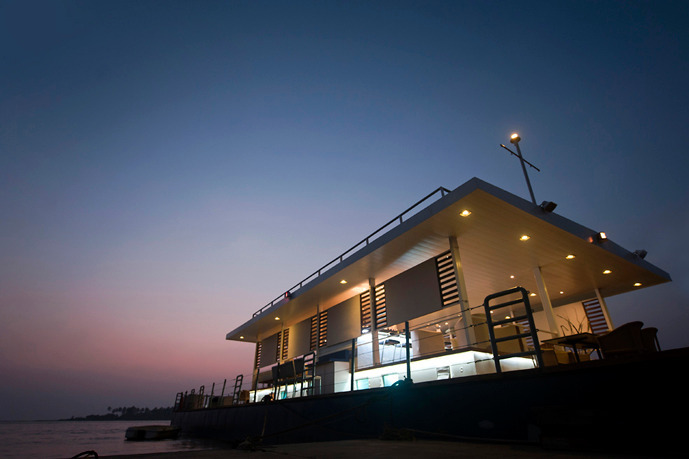 Floating Barge Restaurant at Goa, by SDM Architects - ArchitectureLive! The client for this project dealt in sale of luxury yachts to an elite clientele. With a growing demand for these yachts, they wanted to create an interesting space to properly showcase their line of products which are luxury Yachts. This was also meant to be a space where they could host exclusive parties and launch events for their clients. The barge was designed with the intention of being a fitting space to display their yachts, as people could see them outside the confines of showrooms or warehouses. 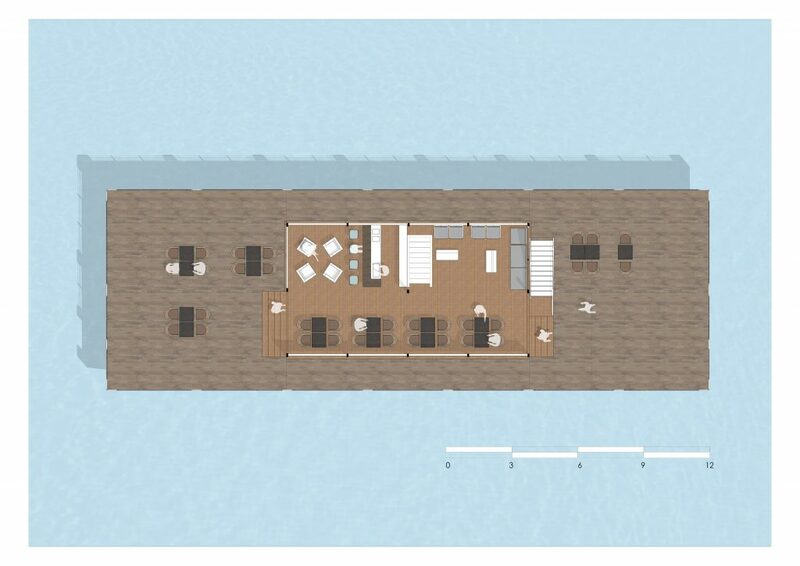 Eventually, when the business changed tracks, the client decided to put the barge to good use by re-purposing it into a humble floating restaurant. Since Goa is well known as a weekend getaway from Mumbai and for its heritage, beaches, shopping and food, this one of a kind experience was thought to be perfect for the place. 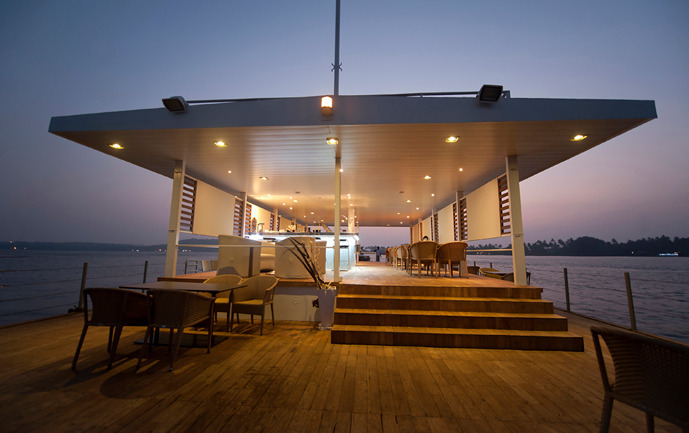 Renovations were done to create a special dining and entertainment space and the barge was shipped out to Goa. It is currently anchored out in the water off Chapora river which is around 24 kms / 40 mins drive from Panjim. The barge is stationery and can very well host about 60 to 80 diners at any given point of time on the lower deck. 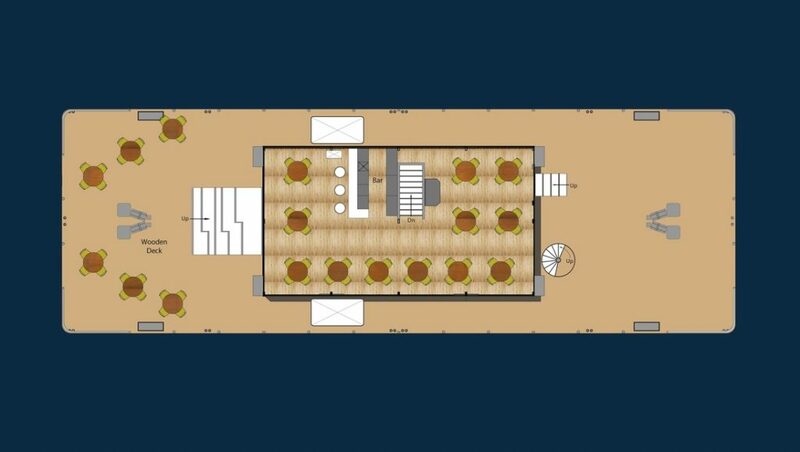 The upper deck can be used for private parties and can be hired for evenings to late nights. The upper decks are well illuminated so they make for a great space which is suitable for evening party entertainment along with only Mediterranean cuisine & eclectic cocktail drinks. The basement of the barge was designed to house all the service and utility areas. 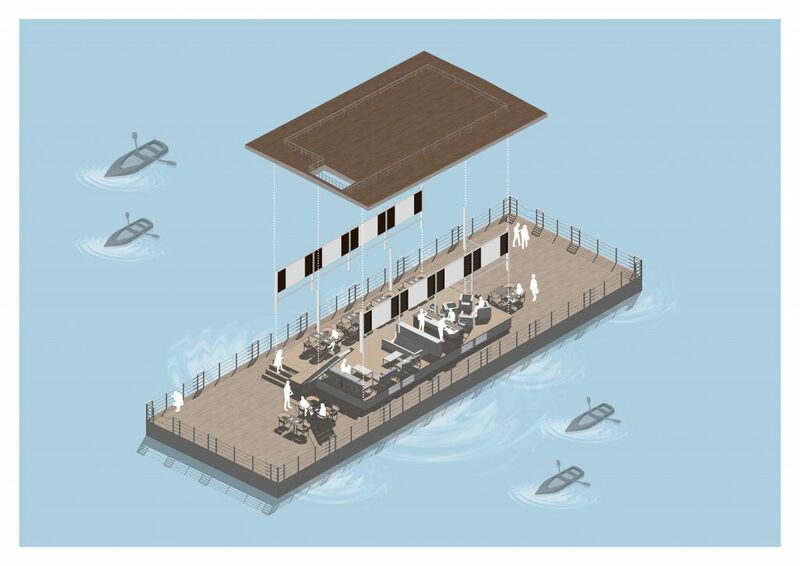 Apart from a working kitchen and toilets, which are required for a running restaurant, the technical requirements of a floating barge had to be studied and designed since it was an operating boat as well. The structural requirements had to be studied from scratch and designed specifically for this purpose. The basement also houses all the ballast tanks, motor rooms, diesel tanks, galleys and fire water tanks. This one of a kind floating restaurant provides a fantastic unobstructed view of the beautiful landscape of Goa from all the dining tables. The location also enables visitors to experience some of Goa’s old-world charm with the interesting sights of floating fishing boats nearby. This floating restaurant is well known locally as one of the best party barges in the area and has been operating well from January 2014 onward.